Cape Town - Former Australia captain Ricky Ponting is of the opinion that if captain Virat Kohli is in top form with the bat at the World Cup then India will win the global tournament. Kohli's average in his last three years of ODI cricket is an astonishing 86.45 and in 2018 he was the ICC Test Player of the Year, the ICC ODI Player of the Year and in the ICC Team of the Year. The 30-year-old already has well over 10 000 ODI runs to his name and Ponting thinks he will essential if India are to win the World Cup this summer. Kohli has also become one of the best finishers the game has ever seen as his country usually wins if he is not out in a run-chase, showing he canhandle pressure. "His numbers show that he is the best (in ODI cricket). How old is he? Maybe 30, and he is going to play another 200 games," Ponting told the Times of India. "I don't think there will be many people who are going to argue against him being the best. Virat's ODI record is unbelievable. "That's why I feel India are a very dangerous side. If Virat has a good World Cup, India will win." Ponting added: "If you can maintain an exceptionally high level for a long, long time, then you are a great. "The best way to describe greatness is someone who has dominated the game for long periods of time. Sachin (Tendulkar) did it, Kohli will. 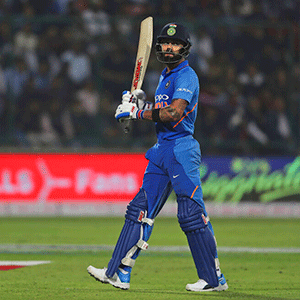 "Virat has found a lifestyle to give himself the best chance to be the best player he can be." The Cricket World Cup will start on May 30 with hosts England taking on the Proteas at the Oval in the opening game.